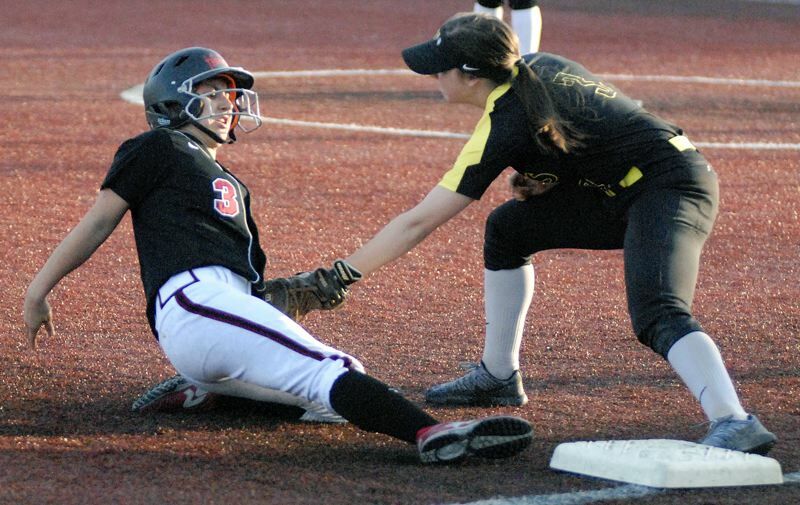 Two highly competitive infielders led the way for St. Helens in all-league softball honors voted on by coaches in the Northwest Oregon Conference. Lion junior shortstop Taylor Dow and senior third baseman Brooklynn Mercier were first-team all-NWOC picks. Two other Lions — senior left fielder Kortney Smith and junior utility player Madi Flores — made the second team. And three players from St. Helens earned honorable mention honors — senior second baseman Hallie Schwirse, sophomore first baseman Brynn Austin and freshman catcher Jasmyne Pense. Dow led the Lions in hitting at .533. "She's extremely competitive at the plate," coach Miranda Little said. "She had only four strikeouts all season, so I knew even in a pressure situation, she'd at least put the bat on the ball." Defensively, and overall as a softball player, "Taylor is always very on top of it and determined," Little said. "You can count on her to make the play when the ball is hit to her. That confidence teammates have in her is really important." Mercier was a key in the field and at the plate, as well. "She's extremely fast, which is something you want on the hot corner at third base, so if the other team bunts, your fielder can get to it," Little said. Mercier also hit .468 with 18 RBIs and struck out just four times. Smith gave the Lions power from the No. 4 spot in the batting order while hitting .367. "In the outfield, she has a really good eye for the ball," Little said. "She can read where it's going to come down, and she has a really good arm and was able to throw runners out." Flores, who batted .356, was the Lions' "Swiss Army knife," Little said. "She played second base, right field, catcher, DP … and she did it all with confidence and exactly how we needed her to. She had only five strikeouts all season, moved runners around and never complained about her role." Schwirse will be remembered for her ferocious play and spirit. "Hallie lays everything on the field every time she plays," Little said. "She makes these insane grabs at second base ... laying out to shut down hitters." Schwirse (.373) batted second in the St. Helens order for a reason. "She's one of the fastest girls on the team, and she used that to her advantage," Little said. "If she saw the defense was playing back, she'd lay down a bunt and then have a fun time running around the bases." Austin (.370) returned at first base after playing there as a freshman. "But this year, she was a totally different athlete," Little said. "I don't think she missed any balls. She scooped up everything. She was the best first baseman defensively in our league and deserved more than honorable mention." Pense was behind the plate to handle two freshman pitchers, Brea Paulson and Alise Gump. "Jasmyne took on huge responsibility this year," Little said. "She did a really good job of keeping the ball in front of her, and she hit well (.383), with only four strikeouts, which is phenomenal for a freshman in our league." St. Helens finished strong to claim fourth place in the NWOC and earn a state playoff berth. The Lions (9-8 in league) wound up three games ahead of Sandy, Wilsonville and Parkrose, who tied for fifth. The Lions were ranked 16th in Class 5A by the Oregon School Activities Association. They dropped a Play-In game to Hermiston 10-5 to finish 11-15 overall.